Aim: This study aimed to evaluate the efficacy of intermaxillary fixation (IMF) screws and modified arch bar. Materials and Methods: This study is a randomized clinical trial in which all participants were divided into two groups of ten in each group and designated as Group A and Group B. In Group A, IMF was achieved by the use of four to six 2×8mm stainless steel IMF screws. In Group B, IMF was achieved by modified screw arch bar. Results: In the present study, a total of twenty patients were analyzed. The average working time for Group A and Group B was 16 min and 29 min, respectively. Oral hygiene scores through modified Turesky Gilmore plaque index were calculated at immediate postoperative period and after 15 days, 30 days, and 45 days. Maximum hygiene was maintained in IMF screw group than modified arch bar group, but maximum stability was observed in the modified arch bar group than IMF screw group. Conclusion: This study emphasizes the use of IMF screws as a quick and easy method than modified arch bar. Oral hygiene maintenance was comparatively better in patients with IMF screws than those with modified arch bar. Modified arch bar was significantly stable when compared with IMF screws; therefore, for patients who require long-term IMF, modified arch bars can be a viable option, but the perforation in the original arch bar may lead to the weakening of the arch bar, and therefore the prefabricated modified arch bar would be a better option. Treatment of maxillofacial fractures depends on reduction and fixation using open or closed techniques and on restoration of normal occlusion. Before fracture reduction, temporary intermaxillary fixation (IMF) with correct registration of occlusion is necessary. This study was conducted after obtaining permission from the Ethical Committee of Sumandeep Vidyapeeth and informed patient consent. All the procedures were performed by the same operator under local anesthesia. The study was conducted in the following steps: patients with fracture of mandible such as parasymphysis, symphysis, and condylar fracture who needed IMF and agreed to participate in the study were included in this study. Patients with pan facial and comminuted fractures, angle or body fracture of mandible, maxillary fracture, edentulous arch, respiratory problems, primary and mixed dentition, mobile teeth in upper and lower arch, bone pathology, history of radiation therapy, and partially dentate patients whose dentition precluded were excluded from the study. A detailed case history was taken by clinical examination. Pretreatment orthopantomogram findings were obtained. The selected patients were divided on the basis of lottery system into two groups of ten each and designated as Group A and Group B. In Group A, IMF was achieved by the use of four to six 2 mm × 8 mm stainless steel IMF screws [Figure 1]. After appropriate local anesthesia, holes were drilled through mucosa without any gingival incision between the canine and first premolar in each quadrant. —Four to six screws were used; the third pair was used in the same way over the dental midline and its need was dictated by the clinical condition. Self-drilling stainless steel IMF screws, 2 mm in diameter and 8 mm in length, were inserted through the predrilled holes, taking care not to penetrate the palatal or lingual mucosa. IMF was achieved using wires or elastic bands. The intended surgical procedure was carried out. Screws were left in place to enable postoperative traction to correct small discrepancies in occlusion. All procedures were done under antibiotic coverage. In Group B, IMF was achieved by a modified screw arch bar. A conventional arch bar was modified by making perforations in the spaces between the winglets along the entire extension of the bar [Figure 2]. In the patient under local anesthesia, the arch bar was adapted to the vestibular surface of the maxilla and mandible, close to the cervical portion of the teeth, and perforations were made in the inter-radicular spaces with a 1-mm bur, taking care to avoid perforation of the tooth root. After this, 1.5-mm screws were placed to fix the bar. It was not necessary to tighten the screw much, just enough to achieve stabilization of the arch bar so that the gingival tissue was not compressed, which could lead to ischemia and necrosis. Screws (two anterior and two posterior) are sufficient for good stabilization of the arch bar in order to perform the IMF. Additional screws were used, whenever necessary. Oral hygiene scores through modified Turesky Gilmore plaque index [Table 1] were calculated at immediately after placement of arch bar or IMF screws, after 15 days, 30 days, and 45 days. Statistical analysis was performed with SPSS statistical software for Windows, version 10.0 (SPSS, Inc., Chicago, IL, USA) using Chi-square test. In the present study, a total of twenty patients were analyzed, among which ten patients with IMF screws (Group A) and ten patients with modified arch bar (Group B) were divided. Each group consists of two female and eight male patients. The average working time for Group A (IMF screws) and Group B (modified arch bar) was 16 min and 29 min, respectively. Oral hygiene scores through modified Turesky Gilmore plaque index were calculated at immediate postoperative period and at 15 days, 30 days, and 45 days. The mean score of IMF screw group reduced to 1.73 ± 0.39 from initial score of 2.12 ± 0.50 with P < 0.001. In the modified arch bar group, there was no significant difference from immediate postoperative period to 45 days postoperatively with P = 0.12. Thus, we reported that the maximum hygiene was maintained in IMF screw group when compared to modified arch bar group. After the placement of IMF screw and modified arch bar, there was a statistically significant difference in the stability, and the maximum stability was seen in the modified arch bar group than IMF screw group. In one patient, IMF screws became unstable after 15 days, while another two patients reported with unstable IMF screws post 30 days; after 45 days, there was a single reported case of IMF screw loosening in Group A. In Group B, it was found that there were two cases of unstable arch bar post 30 days and no cases of unstability thereafter. Thus, we found that on stability parameter, modified arch bar was found to be significantly stable, with P = 0.04 than IMF screws. In respect to mucosal coverage, maximum mucosal growth was observed in IMF screw group, with partial coverage in all patients after 15 days and two cases of full mucosal coverage after 30 days. Another two patients reported with full mucosal coverage after 45 days, whereas there was a single reported case with partial coverage seen after 45 days with modified arch bar. On evaluation of results, we found that the least amount of mucosal growth was seen in Group B. When complications were taken into consideration, similar complications were reported in Group A as well as Group B. There was one case in each group with tooth root injury while placing the screws. Erich arch bar or eyelet wires are the most common methods of achieving IMF, although other techniques are described. These methods are relatively time-consuming for application and removal of arch bars besides having an inherent risk of perforation of the surgeons' gloves and consequent “needle-stick injury” caused by the sharp-ended wires. Moreover, this technique is difficult to use when the teeth are grossly carious, periodontally compromised, crowded, and have extensive crown and bridgework in the oral cavity. Final tightening of wires during the placement of conventional arch bars around the teeth may cause “necrosis of the mucosa,” “extrusion,” and subsequent loss of vitality of the tooth. It is also not easy to maintain the gingival health. To overcome the drawbacks of conventional arch bars, IMF screw technique was described by “Arthur and Berardo in 1989,” which utilizes at least four “self-tapping titanium or stainless steel screws” inserted through the mucosa, one for each quadrant. The screws were 8 mm in length and 2 mm in diameter which were inserted at the “junction of the attached gingiva” and “mobile mucosa” between the canines and first premolars. Reference to the radiographs may give significant information regarding the space available for the insertion of the IMF screws. 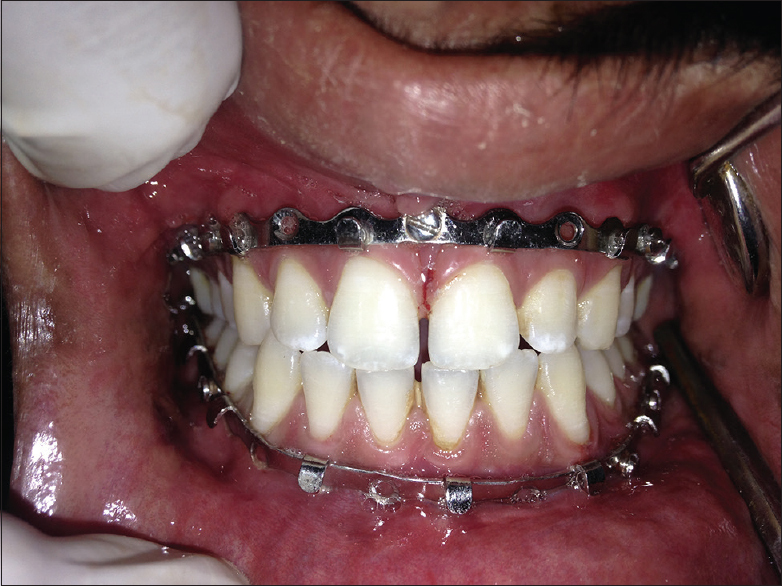 There are many advantages to this procedure, with respect to the use of conventional arch bars. Arthur and Berardo suggested the use of “threaded titanium screws of 2-mm diameter and 10 to 16 mm in length” for IMF, which was later modified by Rai AJ. He designed the screws with capstan-shaped head which allowed the wires and elastics to be held “away from the gingival tissue.” These screws are “quick and easy” to insert and have fewer risks of needle-stick injury than traditional methods. The operating time is also reduced from hours to minutes; hence, these screws are recommended for temporary intraoperative IMF and postoperative elastic traction. The preferred site for screw placement was the alveolar bone between canine and first premolar, but in cases having fracture line in canine and premolar regions, the screw position needs to be changed depending on the fracture site and line of incision. Screw placement within the confines of the maxillary or mandibular alveolar process between inter-radicular spaces was suggested. The width of the “inter-dental bony septa” converges toward the occlusal surface, while the root circumference of the adjacent teeth enlarges and, for this reason, the risk of hitting a tooth root increases progressively by placing the screws closer to the coronal third of the root. In the mandibular premolar region, the loose soft tissue envelopes the tooth “immediately surrounding the mental foramen.” Hence, the placement of IMF screws has to be avoided to prevent injury to neurovascular bundle. The muccogingival line and the attached gingiva give a reliable guidance to the intermediate third of the tooth roots both in the maxilla and mandible. While using IMF screws, there may be chance of tooth root injury, mucosal coverage after 4–6 weeks partially or completely, and it starts loosening after 5–6 weeks. To minimize the drawback of IMF screws and conventional arch bar, the modified arch bar was introduced in the year 2013, by de Queiroz. He modified the conventional arch bar by using a No. 701 bur and making perforations between the winglet spaces along the entire extension of arch bar. It can be said that the modified arch bar is a mixture of two techniques, namely IMF screws and conventional arch bars, and hence it can be used for a longer period of time than IMF screws. Modified arch bar utilizes the positive aspect of IMF screws and conventional arch bars. This modified arch bar can also be used in edentulous spaces where the usage of conventional arch bar is not possible. Moreover, it can also be fixed in completely edentulous patients. Nandini et al. also made a comparison between the Erich arch bar and self-tapping IMF screws. The following parameters were considered: duration, perforations in the gloves, acceptance in patients, oral hygiene, iatrogenic tooth root injuries, and needle-stick injuries during IMF with both the techniques. The authors concluded that the IMF using self-tapping IMF screws is an effective technique as compared to the conventional arch bars in the management of mandibular fractures as it shows less number of glove perforations and comparatively better oral hygiene status. In this study, we compared the efficacy of IMF screws and modified arch bar with respect to plaque accumulation, time required for procedure, postoperative stability after achieving the IMF, mucosal growth, and complications encountered for IMF. The average working time for Group A (IMF screws) and Group B (modified arch bar) was 16 min and 29 min, respectively, in which Group A has taken significantly less working time. Moreover, it was confirmed that the IMF screw technique is the quick method to achieve IMF. Gibbons et al. also suggested that using IMF screws is a quick and easy technique for IMF. Oral hygiene of the patients was assessed using Turesky Gilmore Glickman modification of the Quigley Hein plaque index. Plaque was assessed on the labial, buccal, and lingual surfaces at the gingival third of all the teeth. Oral hygiene scores through modified Turesky Gilmore plaque index were calculated at postoperative period and at 15 days, 30 days, and 45 days. The mean score of IMF screw group reduced to 1.73 ± 0.39 from initial score of 2.12 ± 0.50 with P < 0.001. Modified arch bar showed statistically insignificant difference from postoperative period to 45 days with P = 0.12. Thus, we reveal that maximum hygiene was maintained in IMF screw group than modified arch bar group. When stability was checked in both the groups, a statistically significant difference was seen in the stability, with maximum stability seen in the modified arch bar group compared to the IMF screw group. In one patient, IMF screws became unstable after 15 days, while another two patients reported with unstable IMF screws post 30 days and, after 45 days, there was a single reported case of IMF screw loosening in Group A. It was found that there were two cases of unstable arch bar post 30 days and no cases of unstability thereafter. Thus, we found that on stability parameter, modified arch bar was found to be significantly stable than IMF screw, with P = 0.35. Coletti et al. studied 49 patients retrospectively and indicated that the most common complication was screw loosening (6.5%). The reason for screw loosening was due to the force of the musculature, which was exerted while the patient was in IMF, or in patients where the direction of screw was not perpendicular to the occlusal plane. Busch also reported a similar complication in his study. He recommended the use of greater diameter screws placed away from root apices. Coburn et al. reported fracture of screws in three patients (2.4%) treated for mandibular fracture using IMF screws. In our study, there was no incidence of screw breakage during the procedure. The main purpose of IMF is occlusion stability. We found that IMF screws are as good as arch bar for occlusion stability, but the major drawback was difficulty in maintaining it for longer duration (5–6 weeks) due to the chance of screw loosening. In our study, we reported that modified arch bar was significantly stable when compared with IMF screws; therefore, for patients who require long-term IMF, modified arch bars can be a viable option. In respect to mucosal coverage, maximum mucosal growth was seen in IMF screw group, with the reported cases of full mucosal coverage seen in one, two, and four cases on 15th, 30th, and 45th days, respectively, whereas there was a single reported case with partial mucosal coverage seen after 45 days in modified arch bar group. On evaluation of results, we found that least amount of mucosal growth was seen in Group B. According to Sahoo et al., mucosal coverage over the IMF screws was 2.04% at the time of removal, but we reported four patients with a total of six screws having full mucosal coverage after 45 days while all screws were partially covered with oral mucosa. Ueki et al. assessed the skeletal stability after mandibular setback surgery with and without an IMF screw and reported that six IMF screws were covered by oral mucosa in 122 patients. Roccia et al. noted that 4.9% of the screws were covered by oral mucosa. Carl-Peter Cornelius mentioned that soft-tissue burying or mucosal overgrowth of IMF screws was only encountered in studies with screw placement adjacent to or within the mobile mucosa. During the postoperative follow-up period, only one modified arch bar was partially covered with oral mucosa after 45 days. Furthermore, the problem of mucosa covering the screws could be eliminated using customized IMF screws. Rai et al. suggested customized IMF screws that they modified the IMF screws by adding a stainless steel washer, which keeps the oral mucosa away from the IMF screw and avoids the necessity for a second surgical procedure to explore the IMF screw. Coletti et al. reported tooth root injury in two out of 49 (4%) patients. Coburn et al.used IMF screws in their study on 122 patients with mandibular fractures. Complications including fracture of the screws upon insertion and iatrogenic damage to teeth causing tooth loss and bony sequestra around the area of screw placement occurred in five patients (4%). In our study, no such sequestration occurred around the screws. During drilling, initial resistance was felt on penetrating the outer cortex followed by minimal resistance in the cancellous bone. In case of continuous resistance, drilling may be abandoned and an alternate site may be selected to avoid tooth root injury. Inadvertent penetration of the IMF screw shaft or tip into the maxillary sinus does not matter and will heal spontaneously unless the antrum wall is thin and fragile, and the IMF screw will get loose and tilt downward when the wires are applied and tightened. Kusanale reported a case of self-tapping IMF screws which displaced a parasymphyseal fracture after placement of IMF screw. Thus, the author suggested a shorter length of screw which “prevents displacement of sagittal parasymphysis fracture” after placement of IMF screw. We used 2 mm × 8 mm IMF screws for this study to avoid such complications. During the placement of modified arch bar, we noticed that it was necessary that the holes of arch bar and inter-radicular spaces of teeth coincide with each other, which was not always possible. Mandibular anterior teeth have less inter-radicular space; hence, an injury can occur to the anterior tooth roots while placing screws in the modified arch bar. The placement of modified arch bar was more apical than that of conventional arch bar, so it was difficult to give an intraoral vestibular incision for mandibular fracture along with difficulty in the reduction of the fracture, in the symphysis, parasymphysis, and body fractures of the mandible. Modified arch bar was partially covered by mucosa near empty holes after 45 days, while none of the screws of modified arch bar were covered with mucosa, so no additional procedure is required for its retrieval as in case of IMF screws where you need an additional procedure which is uncomfortable for the patient. However, modified arch bars do have consequences such as tooth root injury, particularly in mandibular anterior region due to crowding of teeth. In this study, one patient reported with tooth root injury during placement of modified arch bars. We believe that along with experience iatrogenic cause can be avoided and can be quite useful in edentulous patients though modified arch bars cannot be used in pediatric patients with unerupted teeth as well as in patients with crowding in anterior and/or posterior region. In severely displaced symphysis, parasymphysis, or body fracture of mandible while using modified arch bar technique, splitting the arch bar was difficult. Modified arch bar is a bone-supported arch bar, so while using in displaced fracture of parasymphysis, symphysis, and body fracture of mandible, reduction of fracture site becomes difficult. To our knowledge, no such prospective or retrospective study had compared these two modalities for achieving the IMF, which makes the present study unique. However, the small sample size could be considered the limitation of this study. This study emphasizes the use of IMF screws as a quick and easy method than modified arch bar. Oral hygiene maintenance was comparatively better in patients with IMF screws than those with modified arch bar. Modified arch bar was significantly stable when compared with IMF screws; therefore, in patients who require long-term IMF, modified arch bars can be a viable option, but the perforation in the original arch bar may lead to the weakening of the arch bar, and hence the prefabricated modified arch bar which is available would be a better option. However, on nonavailability of modified arch bar, this indigenous method may be tried upon. Agarwal M, Meena B, Gupta DK, Tiwari AD, Jakhar SK. A prospective randomized clinical trial comparing 3D and standard miniplates in treatment of mandibular symphysis and parasymphysis fractures. J Maxillofac Oral Surg 2014;13:79-83. Nandini GD, Balakrishna R, Rao J. Self tapping screws v/s Erich arch bar for inter maxillary fixation: A comparative clinical study in the treatment of mandibular fractures. J Maxillofac Oral Surg 2011;10:127-31. Lopez-Arcas JM, Acero J, Mommaerts MY. Intermaxillary fixation techniques: An EACMFS workbook on keying occlusion and restoring bony anatomy by intermaxillary fixation techniques. Presented at the twentieth congress of the european association for cranio- maxillo-facial Surgery, Bruges;2010. McCaul JA, Devlin MF, Lowe T. A new method for temporary maxillo mandibular fixation. Int J Oral Maxillofac Surg 2004;33:502 3. Gibbons AJ, Baden JM, Monaghan AM, Dhariwal DK, Hodder SC. A drill-free bone screw for intermaxillary fixation in military casualties. J R Army Med Corps 2003;149:30-2. Tracy K, Gutta R. Are embrasure wires better than arch bars for intermaxillary fixation? J Oral Maxillofac Surg 2014;15:45-54. Satish M, Rahman NM, Reddy VS, Yuvaraj A, Muliyar S, Razak PA, Use of cortical bone screws in maxillofacial surgery – A prospective study. J Int Oral Health 2014;6:62-7. Falci SG, Douglas-de-Oliveira DW, Stella PE, Santos CR. Is the Erich arch bar the best intermaxillary fixation method in maxillofacial fractures? A systematic review. Med Oral Patol Oral Cir Bucal 2015;20:494-9. Rai AJ, Datarkar AN, Borle RM. Customised screw for intermaxillary fixation of maxillofacial injuries. Br J Oral Maxillofac Surg 2009;47:325-6. Busch RF. Re: Jones. Intermaxillary fixation using intraoral cortical bone screws. Br J Oral Maxillofac Surg 1999;37:422. Cornelius CP, Ehrenfeld M. The use of MMF screws: Surgical technique, indications, contraindications, and common problems in review of the literature. Craniomaxillofac Trauma Reconstr 2010;3:55-80. Rai A, Datarkar A, Borle RM. Are maxillomandibular fixation screws a better option than Erich arch bars in achieving maxillomandibular fixation? A randomized clinical study. J Oral Maxillofac Surg 2011;69:3015-8. De Queiroz SB. modification of arch bars used for intermaxillary fixation in oral and maxillofacial surgery. Int J Oral Maxillofac Surg 2013;42:481-2. Roccia F, Tavolaccini A, Dell'Acqua A, Fasolis M. An audit of mandibular fractures treated by intermaxillary fixation using intraoral cortical bone screws. J Craniomaxillofac Surg 2005;33:251-4. Coletti DP, Salama A, Caccamese JF Jr. Application of intermaxillary fixation screws in maxillofacial trauma. J Oral Maxillofac Surg 2007;65:1746-50. Coburn DG, Kennedy DW, Hodder SC. Complications with intermaxillary fixation screws in the management of fractured mandibles. Br J Oral Maxillofac Surg 2002;40:241-3. Sahoo NK, Sinha R, Menon PS, Sharma R. Retrospective study on efficacy of intermaxillary fixation screws. Med J Armed Forces India 2009;65:237-9. Ueki K, Marukawa K, Shimada M. The use of intermaxillary fixation screw for Mandibular setback surgery. J Oral Maxillofac Surg 2007;65:1562-68. Kusanale A. IMF screw induced displacement of a sagittal fracture of the mandible. Br J Oral Maxillofac Surg 2011;49:246-7.